We thrive on a three-tiered model: great quality, low cost, at most convenience. Through Paint Doctors' 25+ years in business, we have developed and perfected techniques of painting cars that we believe to be the best around. Not only have we worked to make our customers happy with our work, but also with our prices. The main thing that sets us a part, however, is our ability to provide these services at your convenience. We make house calls which allows us to do touch ups and small-medium spot repairs at your house for no extra cost! See below for a brief description of all of the services we provide. These are typically minor repairs such as scratch fill-in and chips in paint. 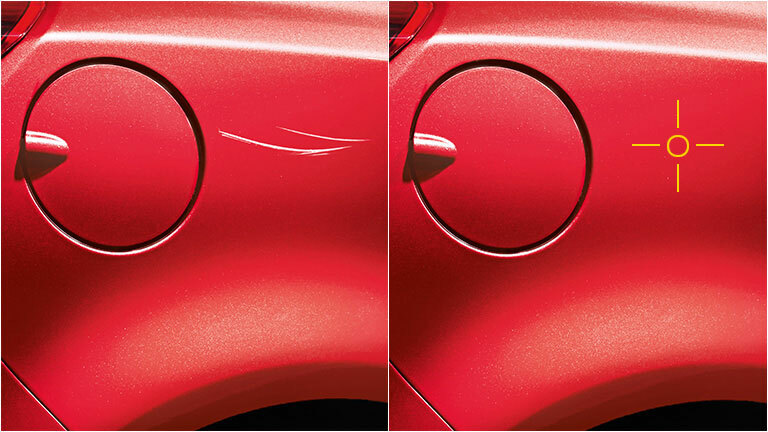 In this process we match the paint based on your VIN# and paint over the scratch or chip. This can include color sanding and buffing depending on the depth of the repair. These can be either minor or major repairs depending on the depth and width of the scratch, paint chip, rust, factory defect, small collision repair, etc. During this process we will sand the area down, apply filler, place a coat of primer, paint the area, then apply a top coat of clear. This will fully repair the scratch or chip from the base up. These consist of paint repair for an entire panel of a vehicle: hoods, bumpers, doors, fenders, etc. Same process applies from spot repair based on severity of needed repair. Headlight Restoration - After much use headlight can become discolored or foggy, making it difficult to see. We restore lens back to the original condition and remove discoloration. Deodorization - We eliminate interior odors such as smoke, pet odor, spills, etc.